Northumberland County Council have initiated another plan to try to alleviate parking problems in the town. 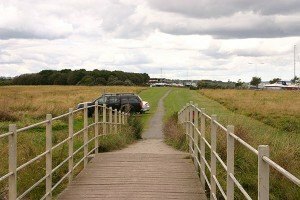 Working with Amble Town Council, Amble Business Club and Amble Development Trust, parking has been designated on some parts of the Braid. The Ambler understands that this is a trial plan and will be monitored by Traffic Enforcement Officers over the August Bank Holiday weekend. 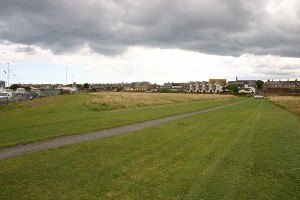 Long term free parking is now allowed on the grassed area alongside the path connecting the bridge over the Gut and may also include the mown area alongside the Marina fence. A meeting between the county council and partners will be held after the meeting to assess how well the trial parking scheme fared over the weekend. The overflow parking scheme runs alongside the weekend Park and Ride trial scheme begun by the county council earlier this summer. 2 thoughts on "Free car parking on Braid this weekend"
What a travesty that the beautiful area of The Braid is to be used as a car park! The Braid is a rich source of wildlife from insect, plants and birds to small mammals. 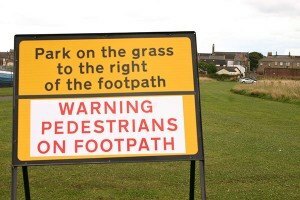 It is used by dog walkers, cyclists, ramblers and families to enjoy a piece of open countryside in safety. What is annoying, is so much derelict land that could be used for parking is tied to Tesco. I hope the relevant committees and the council will re think the use of The Braid and look at the waste grounds or encourage people to use the carpark on the far side of The Braid and their legs. Maybe business owners could have permits to allow them to park in nearer designated parking areas? I understand the need for long term free parking but not at the expense of such a beautiful part of Amble. 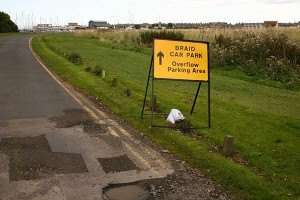 I can’t understand why people are parking on the Braid at the moment when the car parks are no where near full, surely the term overflow means when the car parks are full! I hope this is a temporary arrangement as it will not take long before parts of the Braid are destroyed by cars.